a season six times. Ingram, who joined the Giants on Jan. 13, 2004, has 26 years of coaching experience, including 19 as an assistant to Tom Coughlin. In 2009, Ingram coached a group of backs that was productive despite debilitating injuries. But the Giants still rushed for 1,837 yards and 14 touchdowns. Brandon Jacobs played all but one game with a knee injury that required postseason surgery and led the team with 835 yards. He is seventh on the Giants' career list with 3,455 rushing yards. Ahmad Bradshaw was limited to one practice day most weeks because of ankle and foot injuries, yet led the team with seven rushing touchdowns. He ran for a career-high 778 yards. The reserve backs didn't escape injury. Danny Ware missed five games after dislocating his elbow in the season opener and promising fourth-round draft choice Andre Brown ruptured his Achilles tendon in training camp and missed the entire year. Under Ingram's tutelage, the Giants had the NFL's most productive running attack in 2008. The Giants rushed for NFL-leading and franchise record numbers of 2,518 yards and 5.0 yards per carry. The previous records were 2,451 yards in 1985 and 4.7 yards an attempt in 2005 and 2006. From 2004-08, the Giants finished no worse than 11th in the NFL in rushing. In 2008, Jacobs led the Giants with 1,089 rushing yards and Derrick Ward was close behind with 1,025. They became just the fourth pair of running backs from the same backfield - and only the fifth set of teammates - to each rush for more than 1,000 yards in the same season. Jacobs and Ward rushed for a combined 2,114 yards, the fourth-highest total by a running back tandem that season. In addition, Bradshaw - the team's leading rusher in the 2007 postseason - ran for 355 yards and fullback Madison Hedgecock was voted a first alternate to the NFC Pro Bowl team. Such excellence has been a part of the backfield since Ingram's arrival. Jacobs led the Giants with 1,009 yards in 2007. In Ingram's first three seasons with the Giants, Tiki Barber emerged as one of the very best running backs in the NFL and one of the finest players in franchise history. Barber, who retired following the 2006 season, had never played in the Pro Bowl prior to Ingram's arrival. But he was voted to the NFC team each of his final three seasons. In those three years, he rushed, in order, for 1,518 yards in 2004, a team-record 1,860 yards in 2005 and 1,662 yards in his final season. Barber, who rushed for 5,409 yards in his first seven Giants seasons, ran for 5,040 in just three years under Ingram to finish with a franchise-record 10,449 yards. Barber set the Giants record with 234 rushing yards at Washington in his final regular season game, breaking the mark of 220 yards he had set the previous season. Ingram also helped make Jacobs one of the NFL's best short-yardage and goal-line backs in limited playing time his first two seasons. In 2004, Jacobs was the first Giants rookie to score seven touchdowns since Bobby Johnson in 1984 and the first to rush for seven touchdowns since Bill Paschal ran for 10 scores in 1943. The following season, Jacobs rushed for 423 yards and nine scores to establish himself as Barber's successor. Prior to joining the Giants, Ingram was the running backs coach under Coughlin at Boston College and in Jacksonville. The Jaguars were the only NFL team to rush for more than 2,000 yards in each season from 1998-2000, including an NFL-high 2,091 yards in 1999. Under Ingram's direction, Fred Taylor rushed for more than 1,200 yards three times, including a team-record 1,399 yards in 2000, when he missed 3½ games. Taylor had nine consecutive 100-yard games, tied for the third-longest streak in NFL history. In 1998, the Jaguars rushed for a team-record 2,102 yards. Ingram is also known for turning his running backs into fine blockers and receivers; when he left Jacksonville, running backs had two of the three longest touchdown receptions in team history. 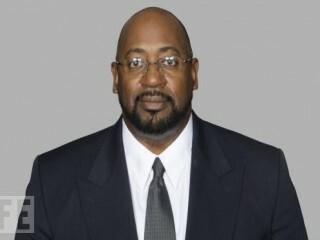 Ingram joined the Jaguars on March 3, 1994, 18 months before the franchise played its first regular season game, and stayed in Jacksonville until Coughlin left following the 2002 season. He was one of four assistant coaches who were with Coughlin during his entire tenure with the Jaguars. Prior to his time in Jacksonville, Ingram spent three seasons as the running backs coach at Boston College. He began his coaching career in 1984, as a graduate assistant at the University of Michigan, his alma mater. The following year, he joined the staff at Ball State, first as tight ends coach, then as the running backs coach for five seasons. In 1991, he joined Coughlin at Boston College. A fullback at Michigan, Ingram earned three letters and played on two Wolverines teams that won the Big Ten championship and advanced to the Rose Bowl. He graduated in 1984 with a degree in general studies. Ingram was born in Dayton, Ohio. He grew up in Beaver, Pa. He and his wife, Kathleen, have a son, Julian. View the full website biography of Jerald Ingram.